Based in India. Founder of Krishi Avam Paristhitiki Vikas Sansthan (KRAPAVIS)— a Member of the ICCA Consortium—Aman has overseen the regeneration of over 125 Orans (community conserved areas) in Rajastan (India) and has taken steps to influence policy changes and legislation in the state. In his research and documentation about the Orans, Aman has written extensively on community conserved areas, ecology, and pastoralism. He has received recognition and numerous awards in India and abroad. 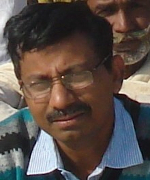 Among his current initiatives are the organisation of Sodhyatra (a Hindi term used to describe a journey into the countryside, made by an individual or a group of people, with the aim of seeking and documenting traditional knowledge of the Oran), whereby local village youth are involved in the documentation of traditional knowledge for conservation and sustainable livelihoods. Aman has also conducted training, developed documentary videos, and worked to establish an Oran Resource Centre.